I don't often write much about my Appellation America gig here on LENNDEVOURS. But, for those of you that don't know, I'm the regional correspondant for both the Long Island and Hudson Valley regions. What this means is that in addition to helping build appellation consciousness for the two regions, I'm responsble for tasting and recommending their wines as well. It's hard work, but somebody has to do it, right? The cool thing is that editorial really drives the Appellation America site -- a rarity in the wine media world to be sure. Starting today, I'll highlight my Appellation America wine recommendations for the week here on LENNDEVOURS, along with any feature stories that I've written or that others have written that I find interesting. This week, I only tasted two wines worthy of recommending -- both from the North Fork of Long Island. Merlot may be king on the North Fork, but some of the best wines are red blends (usually with cabernet franc and cabernet sauvignon). Ternhaven Cellars' 2001 Claret D'Alvah is one such blend. Well balanced and flavorful, it really represents the well-regarded 2001 vintage. Read my full review. You know I love riesling, including those from the Finger Lakes. But, every now and then, a Long Island bottling grabs my attention. Peconic Bay Winery's 2005 Riesling is one such wine. Riesling can be made in a variety of ways, but this one is a riesling for riesling lovers. Read my full review. Appellation America is an interesting site. If you haven't checked it out yet, do yourself a favor and do so. For the month of October, The Tasting Room at the New York Wine & Culinary Center will be pouring wines that won gold, double gold or best-in-class at the New York Wine & Food Classic earlier this year. This is a great opportunity to taste some of New York's best wines. Tasters will be able to choose among seven different tasting flights (listed below) and beginning Saturday, October 7, a special tasting of the Governor’s Cup winner, Hermann J. Wiemer Dry Riesling 2005 will be available. The Tasting Room hours are Monday through Thursday from 10 a.m. to 7 p.m., Friday and Saturday from 10 a.m. to 9 p.m. and Sunday from noon to 5 p.m.
Non-alcoholic options are also available. For more information, please visit www.nywcc.com. Wine Blogging Wednesday #26 Announced: Where's Wino? Leave it to Beau to come up with a great, and innovative, theme for the next edition of everybody's favorite wine blogging event. Rather than ask us to drink a bottle made with _____ grapes from ______ region that costs _____ dollars, he's turned this WBW thing on its head. Instead, he's given us a list of regions to choose from and he's made a game out of it -- Where's Waldo style. When you post about your wine, don't tell us the name or where it's from. Why? Because the WBW participant that can guess the origin of the most wines wins a prize. The fun begins on October 11. 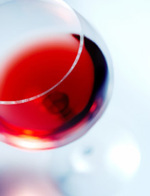 Get all full details and find out what wines you can choose from. This was borrowed from an appetizer Derrick served when Nena and I were out in the Bay area. Instead of speck, I used Prosciutto di Parma and added the drizzle and pine nuts. Of course, I don't have a "crazy fig lady" to get my figs from. I had to use grocery store-bought ones. They turned out very good though...and this wine was even better than I expected. Peconic Bay makes a decent riesling in most years, but this one...this is definitely a riesling for riesling lovers. The cheese pumkin that I picked up at the farmers market was actually the impetus for this entire meal. You can find a million recipes for pumpkin soup but I picked and chose from several to come up with my own (which I didn't write down). I also bought some fresh, local apple cider, added some real maple syrup, allspice, cinnamon and ginger and reduced about two cups to half a cup. I just drizzled a little on the soup before serving. The wine, while not as good as some of Lenz's previous efforts, worked well here. If I had to do this meal over, I would have sucked it up, ignored my guests and just made regular risotto just before serving. Instead, I made it ahead of time, formed it into cakes and then had some trouble keeping them together when pan frying. The flavors were still good, but the presentation wasn't what I wanted. I thought that the wine, a white blend, was overpowered by the fried bits as well. I don't like brussels sprouts -- or at least I didn't until I tried shredding them and frying them with bacon and onions. I had hoped to get local sprouts, but I wasn't able to find any. Turns out that they need a few cool nights before they really come out, so mid-October is their best guess out east. I did a three-hour maple brine for the tenerloin and then rubbed it with some basic bbq rub. Nena thinks that the pearl onions didn't work here (usually I just put a little sliced onion in) and I think she's right. They just weren't as sweet as expected. This wine is delicious and I'm glad I have a couple bottles left. M brought cheeses from his local Whole Foods (which is also the one nearest our house...about 45 minutes away). I honestly don't remember much about them other than I loved the hard Italian cheese. Maybe he'll see this post and enlighten us? The Sherwood House merlot is a wine that doesn't get enough fanfare...it's a house favorite. Simple dessert -- luscious nectar of a wine. The wine was the star of this course and that's no surprise. Macari's Block E is typically one of my favorite ice-style wines each year. Don't cry for me Argentina Long Island? Once a major component in the wines of Bordeaux, this large, fairly easy-to-ripen black grape is now best known in Argentina, where it is most often bottled alone, and as a bit player (along with cabernet sauvignon, cabernet franc, merlot and petit verdot) in in Meritage and other blended red wines in U.S., Australia and South Africa. So it only makes sense many of Long Island's meritage-style reds feature small amounts of malbec -- typicaly from 1 - 7%, but it's rare to see a varietal bottling that is all -- or mostly -- malbec. But, in a game of vino role reversal, this bottling from Raphael is 95% malbec with just a little (5%) merlot blended in. A deep violet-crimson in the glass, this wine has an intense nose of black currants and other black fruit, black tea and cedar. With time in the glass, these secondary aromas strengthen and evolve. Rich, concentrated black fruit flavor greets the palate and is accented by a definite black tea note and faint hints of cigar box. Medium, slightly chewy, tannins provide nice structure and the finish is medium long. As the evening went on, this wine continued to evolve and develop...very nice. I got an interesting email yesterday from my contact for one prominent Long Island winery. The winery's owner has decided that it will no longer be sending samples to me, or any member of the press, for review. From now on, he'd wants all wine tastings/reviews to be conducted at the winery, with him present. This winery isn't the only one that doesn't do samples...but the others are small, low-production wineries that sell out of their wines to their wine clubs regardless of any press coverage. This new member of the "no samples" club isn't one of these artisanal producers -- not by a long shot. I'll still cover the winery, and I'm trying to schedule a tasting with said owner...but I won't be doing any straight wine reviews based on it. I do all of my true reviews in my home in a controlled environment. I taste wines right out of the bottle, often blind against at least one other similar blend/varietal...then with appropriate food...then again later after some time decanted. And, in the case of white wines, I try to taste them at a variety of temperatures. I like to give you, my readers, a full picture of a wine...not a review based on a couple minutes at a winery with an owner/winemaker telling me what I should be tasting. * If you've driven by their tasting room on Main Road in Southold, you've probably noticed that Bedell Cellars is sporting a new logo. I always liked the old logo, but the new one is simple, clean and somewhat modern — and seems more in line with the design of their tasting room. * On October 1, Bedell will also release the latest member of its Artist's Series family of wines — 2005 Gallery. The wine is a blend of chardonnay, sauvignon blanc and viognier. 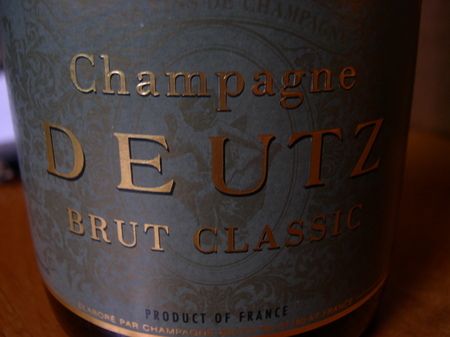 The label was designed by artist Ross Bleckner and only 200 cases were made. Many of those bottles will be sold to their wine club, so get some if you can. * Osprey's Dominion Vineyards is celebrating its success at the recent 2006 Atlantic Seaboard Vinifera Wine Competition. 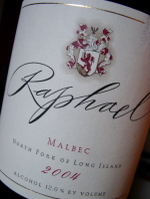 Their 2002 Reserve Merlot was the most successful Long Island entrant, winning "Best Merlot" and "Best of Show." * This fall, keep an eye out for two new tasting rooms — one for Baiting Hollow Farm Vineyard and one from Diliberto Winery. Baiting Hollow's room will be on Sound Avenue while Sal and Maryann Diliberto will open theirs on Manor Lane in Jamesport. Manor Lane is a little off the wine trail, but the wines are worth the detour. * Are you a fan of ABC's The Bachelor? Visit Castello di Borghese this fall and enjoy their "Taste to Romance Tasting." Marco and Ann Marie Borghese put the tasting together to celebrate the fact that their cousin, Prince Lorenzo Borghese, will be looking for his princess on The Bachelor: Rome. * I've written about the Long Island Merlot Alliance before, and I'm happy to say that the member wineries have finally released their first co-produced wine, Merliance 2004. 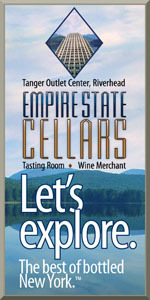 It sells for $35 per bottle and much of that money goes towards merlot education and research on the East End. Pick up a bottle or twelve at any member tasting room — Wolffer Estate, Sherwood House Vineyards, Pellegrini Vineyards, Shinn Estate Vineyards and Raphael. * The 2004 vintage of my favorite Long Island dessert wine, Macari Vineyards' Block E, will be released in coming weeks. Look for it the next time you visit Macari for some of the best vineyard views around. * Christopher Watkins, former manager of The Tasting Room on Peconic Lane has taken over the tasting room at Roanoke Vineyards. This poet and former professional musician and brings plenty of knowledge — and a unique perspective — to the Roanoke team. His wife, Amy Marinelli, has also joined the Waters Crest Winery tasting room staff. * Last, but far from least — Lenz Winery's winemaker Eric Fry has released his 2001 Old Vines Merlot. 2001 was a banner year and while Kip Bedell is Mr. Merlot, you could call Fry the Merlot Maestro. This is an age-worthy merlot that may prove to be a benchmark wine for the region. Vidal (or vidal blanc) is a hybrid grape that doesn't get the respect it deserves -- at least when it's done well. No, it's not as rich and complex at a well-made, balance chardonnay and it doesn't have the bright elegance of riesling. But, as far as white hybrids go, it's among my favorites. Vidal is perhaps best known for it's role in some delicious late harvest and ice style wines from Canadian and upstate New York producers. But, with high acidity and medium body, dry renditions can be tremendously refreshing and food friendly. 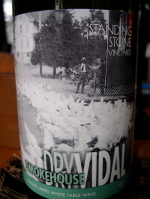 Standing Stone Vineyards NV Smokehouse Dry Vidal ($9) is both. This medium-bodied white is named "Smokehouse" for the former smokehouse on the property, and the grapes were harvested in late October 2005 at 20.5 Brix. After pressing, the juice was cold settled for 24 hours to reduce solids before fermentation, which was done 100% in stainless steel tanks using Epernay II and VL1 yeasts. On the nose, spring flowers and ripe golden delicious apple aromas dominate with oh-so-subtle mineral notes in the background. The wine's flavors are pretty simple -- ripe apple, mango and flowers -- but nice acidic structure and a pleasant, surprisingly long finish make this an excellent option for a wide range of foods. Roast chicken comes to mind. The Finger Lakes are amazingly suited to a great many white varieties, and vidal -- both as table and dessert wine -- is one of them it seems. Winemaker Les Howard's 18-plus months at Jamesport Vineyards have been some of the craziest of his winemaking career. There was the stressful-but-successful 2005 harvest season that may prove to be one of Long Island's finest. 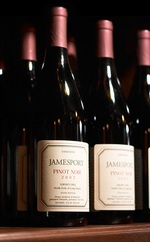 There's how he's developing his own style as head winemaker while maintaing the quality Jamesport is known for. And recently, he's been able to enjoy impressive scores from Robert Parker's Wine Advocate. "Things cannot be much better here at Jamesport," he wrote recently in an email. Howard, a Long Island native, "never thought of being a winemaker" when he first started at Pindar Vineyards over a decade ago. It was only once Mark Friszolowski, then Pindar's winemaker, told him that he'd make a good winemaker that he considered it as a career option. Roth, in particular seems to have influenced Howard greatly, "Working at Wölffer, with Roman, was the turning point in my career,” Howard said. The post at Jamesport is Howard's first as head winemaker, and he's made the transition rather smoothly. "I've been in the industry here on Long Island since 1994 and have worked at four larger, established wineries. Now as head winemaker I can use the skills I've learned throughout my career and develop my own winemaking practices," he said. The biggest surpise for Howard has been "how rewarding it is to make great wine and be credited as the winemaker." And make great wines he has — already. 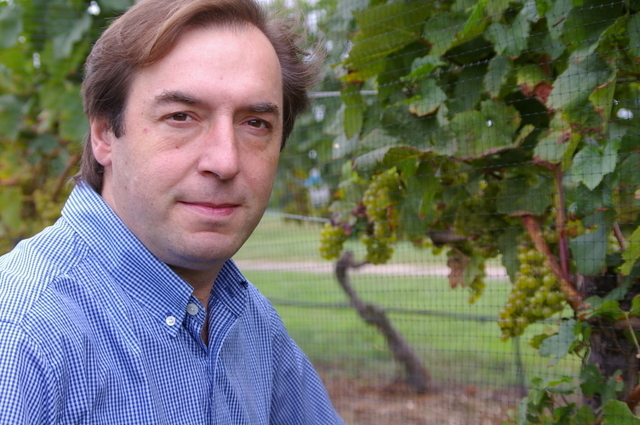 Many of the wines rated highest in the recent issue of the Wine Advocate were started before Howard joined Jamesport, but he bottled their 2004 Late Harvest Riesling. In addition, David Schildknecht, who tasted and reviewed the wines of Long Island for WA, "…liked the 2005 sauvignon blanc and said the 2005s from barrel were highly promising," according to Howard. But do the high scores — largely for wines made before he took over — put any added pressure on Howard? If it does, Howard won't admit it, saying "The high quality of the previous vintages Jamesport has produced is why I chose to work here. This makes me feel great that our wines are so well regarded. Also this makes me even more confident that we can continue to make excellent wines." In addition to the highly popular 2005 Sauvignon Blanc, which offers green apple, grapefruit and vanilla-earthy aromas and melony, appley and slightly tropical flavors with earthy and vanilla-honey notes on a lengthy finish, Howard has recently bottled his 2005 chardonnays, which he calls "wonderful". It's the 2005 red wines that excite Howard the most, however. "These (red) wines are what I consider the best I have ever worked with! (But) we will have to wait until they are finished maturing in barrel and bottled before we can acertain their true greatness." Heading into the 2006 harvest season, Howard is looking forward to his second harvest with Jamesport Vineyards' owner and vineyard manager Ron Goerler Jr. "I'm looking forward to it. The vineyards are performing well and we are expecting a nice crop. The crop is not going to be as large as last year but does have the potential for high quality." Look for Jamesport Vineyards' 2005 chardonnays to be released this fall, with the reds still needing time to mature. In the meantime, enjoy that impressive sauvignon blanc and Jamesport's East End Series of wines, which help support the Southold Project for Aquaculture Training (SPAT). Ten-percent of sales go to the program, which was created to encourage East End residents to become stewards of their environment and help revive the shellfish population in local waters. In just a few years, Shinn Estate Vineyards has built a reputation for their "green" vineyard practices and quality wines that show off the quality of their fruit. Before the upcoming 2006 vintage, the wines were made at other wineries — most recently at Wolffer Estate under the watchful eye of winemaker Roman Roth. With harvest 2006, however, Shinn Estate Vineyards' wines will be estate made and bottled — in a renovated barn right next to their rustic tasting room. They have also hired their first head winemaker, Juan (John) Eduardo Micieli-Martinez, formerly of Pellegrini Vineyards and Premium Wine Group. It's exciting enough to take over as winemaker for a well-regarded producer, but John is also setting up a brand new winery, working with his new bosses to select, purchase and install all of the new equipment. John told me recently in an email that "the most exciting thing is the responsibility" of being the head winemaker. How did this Juarez, Mexico native end up as a winemaker on the North Fork? It's a story of baseball, beer and then Barriques. Champagne is something I openly admit I know very little about, so I was glad that Sam wanted to host a WBW around the stuff. Sadly, as you can tell by the fact that I'm posting my tasting a day late, I didn't prepare very much and didn't learn a whole lot either. But, I did enjoy the wine I ended up with. In the past, well before my palate started to develop, I'd tasted Dom Perignon and all those high-end (expensive at least) Champagnes and I wasn't impressed compared to a $20 bottle of bubbly from California. I didn't see the value and just thought Champagne over-priced. After digging through a lot of garbage online, I learned that this sparkler is approximately 38% Pinot Noir, 32% Pinot Meunier and 30% Chardonnay and that the grapes are harvested in Aÿ, Marne Valley, Cotes des Blancs and Montagne de Reims, with 40% coming from Deutz's own vineyards. The bubbles are vigorous right out of the bottle, eventually settling a bit with a fine bead that lingers for quite a while. 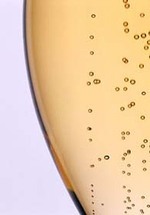 The medium-gold wine offers a intense toasty, yeasty nose with apple, pear and faint berry notes in the background. Bold and flavorful on the palate, the toastiness gives way to a bit more fruit -- mostly ripe pear and apple -- and finishes clean with fruit flavor and refreshing acidity. Again, I'm far from a Champagne expert, but I definitely enjoyed this wine and would most definitely drink it again or serve it at a party. Oddly enough, I made some hot chocolate last night for Nena and popped a mashmallow in my mouth, then took a sip of this bubbly. It was pretty eye opening. I think Champagne will find its way into a dessert pairing at our house one of these days. And yes, I'll be posting a picture tonight when I got home. I took one last night but didn't have time to pull it off of the camera. Thanks to Sam for hosting this 25th vintage of Wine Blogging Wednesday. Keep an eye out on your favorite food and wine blogs for a post announcing the 26th in coming days! For those of you that don't know, Heath Miller is the starting tight end for the Pittsburgh Steelers. So what is it that I have in common with this professional athlete? He was born in in Richlands, VA and went to the University of Virginia. I was born in Pittsburgh, PA and went to Allegheny College. After college, he was taken in the first round of the 2005 NFL draft. I went to graduate school at Carnegie Mellon University. He's a professional athlete who won the Super Bowl last year. I'm a writer/editor/Web marketing guy who wine blogs on the side. He weighs 256lbs. I weigh 256lbs. You read that right, 256lbs. Whether it's my under-active thyroid acting up, post-wedding gain, the fact that men always gain weight when their wives are pregnant, the dozen or so bottles of wine I drink review every week, or the fact that my life has become nearly completely sedentary, 256 is way too big a number to see when I stand on the scale. They say the first step in solving a problem is recognizing it. Maybe doing so publicly here on LENNDEVOURS will jump start me doing something about it. As any food or wine blogger who isn't blessed with the metabolism of a marathoner knows, it's easy to gain weight when your primary hobby is culinary. Miguel Martin, who has worked for several wineries the world over has joined Palmer Vineyards as winemaker. The native of Madrid, Spain native has nearly 20 years of winemaking experience, including winemaking positions at Gonzalez Byass, Robert Mondavi, Yalumba and Catera. "Miguel Martin is an important addition to the Long Island winemaking scene," said Robert J. Palmer, owner of Palmer Vineyards. "He brings not only 10 years of experience working with the highly regarded Robert Mondavi Co., but also has winemaking experience from all over the world. This really qualifies him to understand the uniqueness of Long Island." Martin joins a small, but growing group of international winemakers, who after working in some of the world's best-known wine regions have chosen to ply their trade in Long Island's relatively small region. I guess you can say that the Long Island region is gaining momentum in the world wine community -- not just locally. Palmer's previous winemaker, Tom Drozd, has left the winery but is planning to remain in the local industry. At this point, I've not been able to find out where he's going, but I know he has been making wine for Baiting Hollow Farm Vineyard as well. Lest you forget, tomorrow is Wine Blogging Wednesday #25, hosted by none other than Sam of Becks & Posh. Do I, the monthly event's host, have my wine picked out yet? Um...no. Not yet. But I'm hoping to have it by this time tomorrow. I know so very little about Champagne...so this should be fun. Corey Creek Vineyards, owned by New Line Cinema chairman Michael Lynne, produces mostly white wines (the reds are bottled under sister winery Bedell Cellars' label), including one of Long Island's best gewurztraminers, a flavorful late harvest riesling and two different styles of chardonnay. Too often, Long Island chardonnay is severely over oaked in an attempt to make the rich, buttery style that (unfortunately) remains so popular with consumers. These wines usually fail because, unlike warmer California regions, local fruit just doesn't get as ripe and can't stand up to heavy oak. 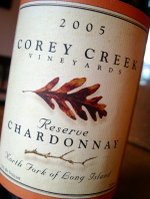 Disappointingly few local producers balance fruit and oak well -- but CoreyCreek Vineyards 2005 Reserve Chardonnay ($30) pulls it off. 2005 was a super-ripe vintage on Long Island and that comes through in this wine. Medium straw yellow in the glass, it has a toasty, citrusy nose that has definite ripe Mandarin orange undertones and grapefruit. It's not the most complex chardonnay, but the balance is impeccable. Rich flavors of lemon, orange, white flowers and toasted bread remain bright and crisp because malolactic fermentation was stopped at 64%. Medium bodied from start to finish, the length is medium long. In August, this was named New York State's top chardonnay at the 2006 New York Wine & Food Classic in Canandaigua. Do I think it's New York's best? No, but it's hard to find a better balanced wine that is more versatile at the table. Fall is one of the most exciting -- and hectic -- times on the East End of Long Island. The grapes have undergone veraison — the green grapes have changed color and started to ripen — and harvest season has begun (for sparkling wine) and will continue well into November. The ever-popular pumpkins and mums are also coming in, so the crowds will be flooding their favorite farm stands and nurseries. They bring a lot of energy to the region -- but they make it harder for me to get to the wineries because of the traffic. As with any wine region, this time of year is also jam-packed with harvest festivals and other winery events. Last Saturday, I attended the Lenz Merlot Classic — a walk-around tasting of some of Long Island's best merlots as well as those from the West Coast, Argentina, Italy and Australia. The Italian wines were interesting, but the real stars were the 2001 Grand Vintage Merlot ($36) from Paumanok Vineyards and 2001 Old Vines Merlot ($55) from Lenz — oh, and the great cheeses from the Artisanal Cheese Center in Manhattan. Overall the other, non-LI, wines were disappointingly bad. Maybe the point was to make LI wines shine, and they certainly did. The next day, I was lucky enough to attend a BBQ at Roanoke Vineyards (pictured right) where they previewed their 2004 vintage reds. There were almost 100 people there, but it had the feel of a family reunion — with much better wines. 2004 wasn't one of Long Islands best, but Rich Pisacano's grapes and consulting winemaker Roman Roth's winemaking talents have combined yet again to make some terrific, age-worthy wines. Of the four, the Blend 2 is the most ready to drink now, with the merlot a close second. I think, though, that their Blend 1 Meritage and the cabernet sauvignon will be the real stars down the road. When Long Island's best reds are discussed, Roanoke isn't often mentioned — but it should be. I may start referring to Rich as The Cabernet King. This Saturday night, Lieb Family Cellars is playing host to the North Fork Film Festival, showing "World Cinema" a program of nine short films from around the world. Tickets are $40 and include wine before the movies, during intermission and after. Call Lieb 631.525.8100 to reserve your seat. The two following weekends, Paumanok Vineyards presents "Oysters & Vin Blanc." Enjoy an afternoon of Paumanok's seafood-friendly white wines and the freshest local oysters bought from local vendors. Visit www.paumanok.com to learn more. On October 8, Wolffer Estate Vineyards will be throwing its annual Harvest Party. Tickets are $65 for adults and $25 for children. Along with lunch, you'll listen to live music, the chance to pick and stomp grapes, take part in barrel-rolling races, enjoy pony and hay rides, and, of course Wolffer's wines. Visit www.wolffer.com or call 537-5106 for more information. 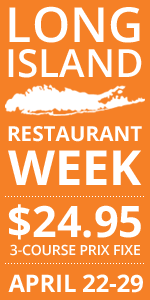 For four days and three nights in October (October 23-26) you can live the Long Island wine life at Wine Camp. For $749 (double occupancy) you'll work the fields, learn tasting technique, blend wines along side some of the best local winemakers and explore food and wine pairing. The package also includes three nights at one of four B&Bs, breakfast each morning, lunch in the vineyards, dinner at a local restaurant the first night, and a multi-course food and wine pairing dinner event to round out the festivities. To learn more, visit www.winecamp.org. If you'd rather learn about wine while you're drinking it, Grand Cru Classes is offering classes every weekend in September and October and Stony Brook University's Center for Food, Wine And Culture is offering food and wine events at its Stony Brook and Manhattan locations. Sam's right...I just don't feel like writing about food or wine today. Riding in on the way to work this morning, I was listening to Howard Stern, just like I do every other morning...including 9/11 five years ago. Today, they replayed the broadcast from that awful day and I had the most painful sort of goosebumps all over my body. We should never forget the terrible events of the day. Ever. I was lucky to not be affected directly by the horrible attacks on the towers. 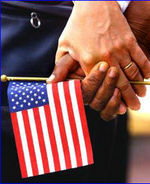 But I have lots of friends who lost friends, loved ones or spouses. Regular, seemingly frivolous blogging about food and/or wine, will resume tomorrow. Do I Need a Formal Wine Education? For the most part, I've taught myself about wine. I devour books about wine. I taste taste taste and taste some more. And I interact with winemakers, winery owners and other wine bloggers/lovers/writers. I've taken a few local classes, including those at Stony Brook University's Center for Food, Wine and Culture. And, they've been a lot of fun and educational as well. And, some day I hope to take some formal classes towards some sort of "degree." But right now it's not a priority -- though if I had time to take a two-hour train ride into Manhattan every weekend for six months to take an expensive series of classes I certainly would. But, I'd not be doing it for the little letters after my name. I'd be doing it for my own education and for fun. I'm only ranting about this because I've had editors tell me that they do not want me writing wine tasting notes because I don't have an MW or sommelier title after my name. And just today, made a point (not in a good way) of pointing out that I'm self taught. 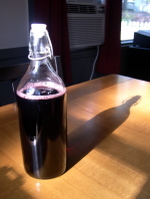 My first batch of AVA-designated red wine vinegar has been siphoned off and bottled. I haven't actually used it in any cooking yet, but I can tell you this -- the flavor is so much more intense than anything you'll buy at any supermarket or even specialty shop. For my next batch, which will be ready in time for holiday gift giving, I'm going to use only merlot from the North Fork of Long Island AVA. I know that I've been a bit lax posting lately, but that's only because real work has gotten in the way. Stay tuned for a bunch of new tasting notes as well as some reports from local wine events and other fun stuff. Oh...and my tasting of Michigan riesling for "50 States. 50 Wineries." will be posted soon as well. It seems that almost every winery calls itself "family run" even if no one in the family ever touches a vine or steps foot in the winery itself. 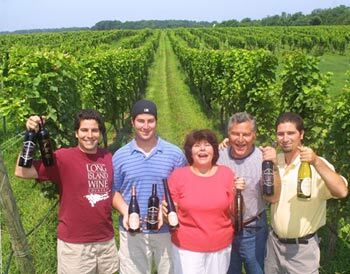 Paumanok Vineyards on the North Fork of Long Island, on the other hand, actually is run by the Massoud family. This month at Appellation America, my North Fork Q&A is with Kareem Massoud, Charles and Ursula Massoud's eldest son. After attending business school and working for a private investment firm in Manhattan, the family vineyard called him back to the East End. Now, he's making the wines alongside his father, Charles, making him Long Island's first second-generation winemaker. What was once a chore for Kareem has become his career. Tonight at 8:30 p.m. my hometown Pittsburgh Steelers begin the defense of their Super Bowl championship. As you know, I'm a huge fan (perhaps the understatement of the century) and I've been eagerly anticipating the return of NFL football. Charlie Batch leads the black and gold against the Miami Goldfish and I'm, of course, predicting a win. I think Nena is going to make pizza tonight, but if you're looking for a more Steelers-centric menu, check out my Ultimate Steelers Tailgage Menu from last year. I'm still undecided on whether or not I'll uncork my Super Bowl winnings...but I just might. And yes, Pittsburgh Steelers football truly is like a religion in Pittsburgh. Just trust me on that one, okay? Well, the LENNDEVOURS empire continues to expand. With this month's Mise en Place feature on the Gilded Fork, I've officially become the site's wine pairing guru. They actually list me on the masthead as an "expert" but that is a bit overstated probably. Wine pairing is much easier than most people think. If you have good food and good wine, chances are you're going to be okay. Of course, there are exceptions...but wine pairing goes far beyond red with meat and white with fish. So, stay tuned as I pair wines with each of chef Mark Tafoya's courses every month. If you haven't heard of the Gilded Fork, check it out. It's a great site that truly brings the sensual, etheral side of food to the forefront. Plus, wine blogging superstar Alder Yarrow is the site's wine columnist.